It is hard to believe but after years of playing the harp, I am thrilled to say that I am releasing an album! I have been so honoured to work on other people’s CDs and to have an amazing performance career so far and now it is time for a new celebration. I can now offer the people who have supported me and a whole new group of listeners, my own album. I named the album These Roads because I feel that this album is an account of the many roads I have travelled throughout my life. I grew up on Manitoban country roads and I have traveled city roads as well as many around the world. All of these experiences have influenced me, my music and my stories thus creating my debut album. One of the reasons why I am so excited about this album is because I had such wonderful people on my side. It began with incredible support from my family, my colleagues and my teachers. Then, I was connected with amazing songwriters, especially my amazing co-writer, Jaylene Johnson. I am so lucky that she and I have always been on the same page. We connected from the beginning. When you click with someone and open yourself up to the possibilities and vulnerability of songwriting, beautiful music can happen. Next, I met up with the man who really understand what I wanted and helped me to create such an amazing product. Stephen Fisk recorded, mixed, assisted production, played and sang on the album. How awesome is that? Everything he did impressed me and I am so lucky that he jumped right in and gave it his all. 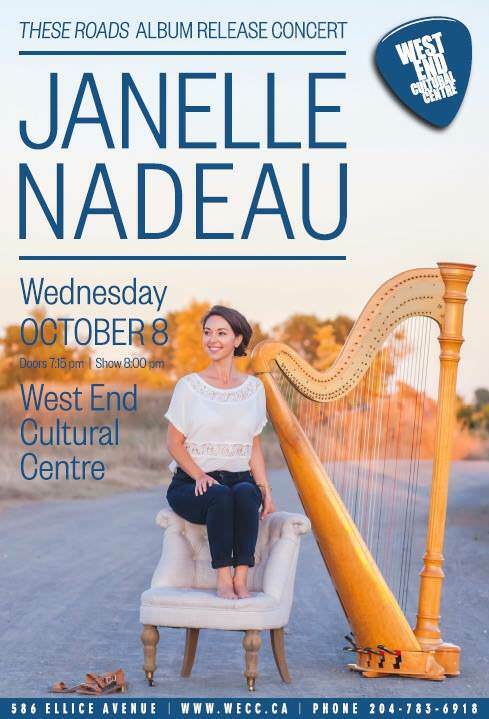 Though there have been so many exciting things surrounding this, one of the things that I am most looking forward to is my album release concert at the West End Cultural Centre! CD Release Set for Wednesday October 8 at the West End Cultural Centre. She’s a Manitoba farmer who also happens to be a classically trained harpist. 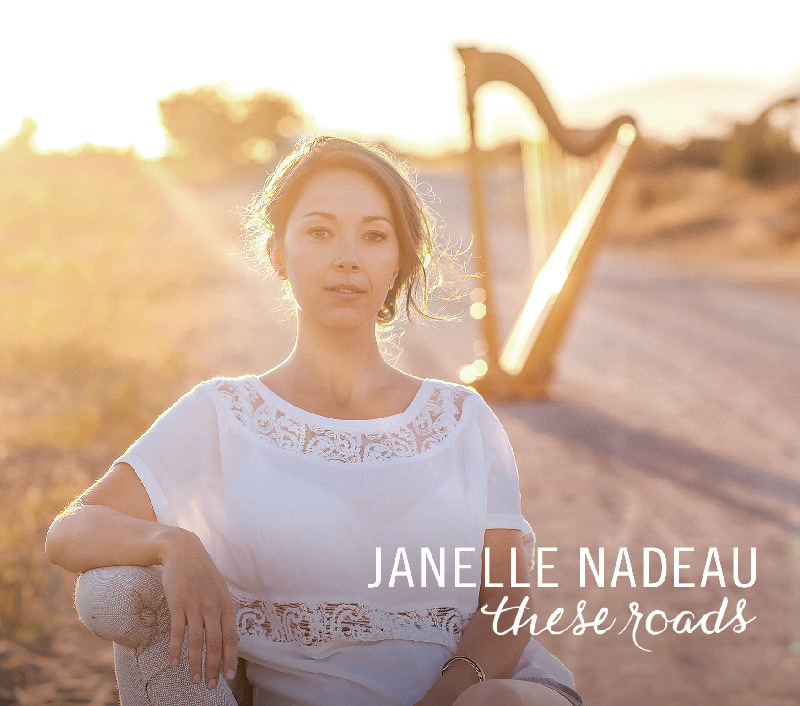 Now, Janelle Nadeau is ‘combining’ her interests, releasing her debut CD These Roads at the West End Cultural Centre on Wednesday October 8, 2014. It’s an interesting juxtaposition. In the summer months, the 28-year-old Manitoban operates huge farm machinery, working the fields as a combine and swather operator at her family’s grain farm in Fannystelle, about 50 kilometres southwest of Winnipeg. For the remainder of the year, Janelle lives and works in Vancouver as a classically-trained harpist. Janelle does not just play the classical harp, but Celtic and electric harp as well.”It weighs about 90 pounds with the case and dolly,” says Janelle of her six-foot high pedal harp. She herself weighs only 120 pounds but manages to lug her instrument around with ease. Janelle’s October 8 concert will feature a blend of Spanish tunes, Celtic, blues, country, popular and original music. This performance promises to be a toe-tapping, lively type of show, paired with introspective moments. Janelle will also showcase her vocal abilities, with her singing a perfect complement to her proficient playing. Ian Mackie (drum/percussion) and Stephen Fisk (guitar/bass/vocals) will accompany Janelle – a fitting selection as Fisk also produced and recorded the album. While this is Janelle’s first CD, she is already an accomplished musician. 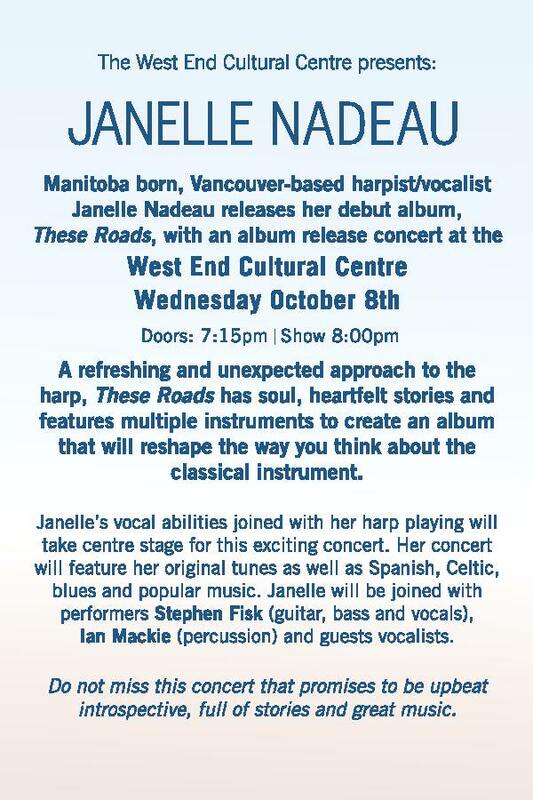 In 2008, Janelle graduated from the Harp Performance Program at the University of British Columbia. She has been touring western Canada and the Yukon for the last eight years with the acclaimed music group Winter Harp, which performs Celtic, medieval, and classical music. She has toured with the Canada National Youth Orchestra, Home Routes and Manitoba Arts Council. She plays regularly with the Vancouver Opera and has played in the Vancouver Symphony Orchestra, and she has even backed up Kanye West during a Vancouver performance. Janelle’s interesting musical history has earned her the respect, and attention of others. Winnipeg radio host Ace Burpee (Virgin Radio 103) recently named Janelle one of 100 Most Fascinating Manitobans of 2013 (Janelle was #51 to be precise). Janelle was also selected as one of five finalists in the On the Coast region of CBC Radio’s Searchlight contest with her song Leavin’ (co-written withJaylene Johnson and Arun Chaturvedi). For more information, please visit www.janellenadeau.com or contact publicist Janelle Johnson at janelle@soundstrategy.ca or 204.330.0853. Thank you so much to everyone for all of your amazing support and I am so looking forward to sharing this with you! 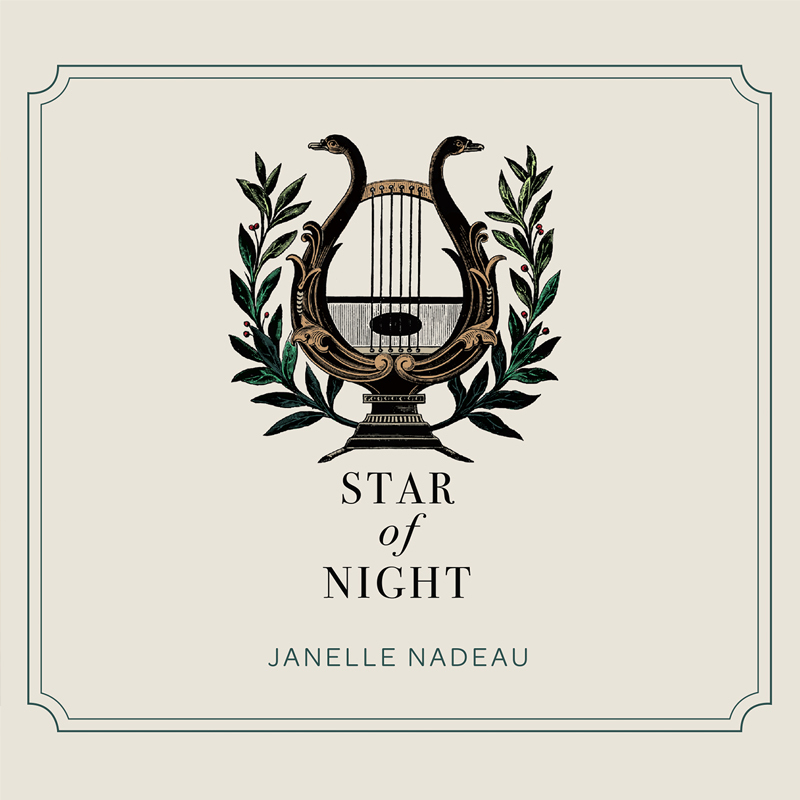 To purchase my album, please email me directly at: janelle@janellenadeau.com. Online purchases soon to come!